Blood libel or ritual murder libel (also blood accusation) is an antisemitic canard accusing Jews of murdering Christian children in order to use their blood as part of religious rituals. Historically, these claims—alongside those of well poisoning and host desecration—have been a major theme of the persecution of Jews in Europe. Blood libels typically claim that Jews require human blood for the baking of matzos for Passover, although this element was allegedly absent in the earliest cases which claimed that then-contemporary Jews reenacted the crucifixion. 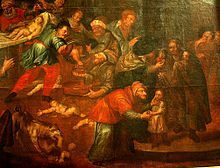 The accusations often assert that the blood of the children of Christians is especially coveted, and, historically, blood libel claims have been made in order to account for the otherwise unexplained deaths of children. In some cases, the alleged victim of human sacrifice has become venerated as a martyr. Three of these – William of Norwich, Little Saint Hugh of Lincoln, and Simon of Trent – became objects of local cults and veneration, and in some cases they were added to the General Roman Calendar. One, Gavriil Belostoksky, was canonized by the Russian Orthodox Church. The supposed torture and human sacrifice alleged in the blood libels run contrary to the teachings of Judaism. According to the Bible, God commanded Abraham in the Binding of Isaac to sacrifice his son, but He ultimately provided a ram as a substitute. The Ten Commandments in the Torah forbid murder. In addition, the use of blood (human or otherwise) in cooking is prohibited by the kosher dietary laws (kashrut). Blood from slaughtered animals may not be consumed, and it must be drained out of the animal and covered with earth (Leviticus 17:12-13). According to the Book of Leviticus, blood from sacrificed animals may only be placed on the altar of the Great Temple in Jerusalem (which no longer existed at the time of the Christian blood libels). Furthermore, the consumption of human flesh would violate kashrut. Also stated in Leviticus is that "it shall be a perpetual statute throughout your generations, in all your settlements: you must not eat any fat or any blood," and that "you must not eat any blood whatever, either of bird or of animal, in any of your settlements." While animal sacrifice was part of the practice of ancient Judaism, the Tanakh (Old Testament) and Jewish teachings portray human sacrifice as one of the evils that separated the pagans of Canaan from the Hebrews (Deuteronomy 12:31, 2 Kings 16:3). Jews were prohibited from engaging in these rituals and they were also punished for doing so (Exodus 34:15, Leviticus 20:2, Deuteronomy 18:12, Jeremiah 7:31). In fact, ritual cleanliness for priests even prohibited them from being in the same room with a human corpse (Leviticus 21:11). The earliest versions of the accusation involved Jews crucifying Christian children on Easter/Passover because of a prophecy. There is no reference to the use of blood in unleavened matzo bread, which evolves later as a major motivation for the crime. The earliest known example of a blood libel is from a certain Democritus (not the philosopher) only mentioned by the Suda, who alleged that "every seven years the Jews captured a stranger, brought him to the temple in Jerusalem, and sacrificed him, cutting his flesh into bits." The Graeco-Egyptian author Apion claimed that Jews sacrificed Greek victims in their temple. This accusation is known from Josephus' rebuttal of it in Against Apion. Apion states that when Antiochus Epiphanes entered the temple in Jerusalem, he discovered a Greek captive who told him that he was being fattened for sacrifice. Every year, Apion claimed, the Jews would sacrifice a Greek and consume his flesh, at the same time swearing eternal hatred towards the Greeks. Apion's claim probably repeats ideas already in circulation because similar claims are made by Posidonius and Apollonius Molon in the 1st century BCE. Another example concerns the murder of a Christian boy by a group of Jewish youths. Socrates Scholasticus (fl. 5th century) reported that some Jews in a drunken frolic bound a Christian child on a cross in mockery of the death of Christ and scourged him until he died. Professor Israel Jacob Yuval of the Hebrew University of Jerusalem published an article in 1993 which argues that the blood libel may have originated in the 12th century from Christian views of Jewish behavior during the First Crusade. Some Jews committed suicide and killed their own children rather than be subjected to forced conversions. Yuval investigated Christian reports of these events and stated that they were greatly distorted, with claims that, if Jews could kill their own children, they could also kill the children of Christians. Yuval rejects the blood libel story as a fantasy of some Christians which could not contain any element of truth in it due to the precarious nature of the Jewish minority's existence in Christian Europe. 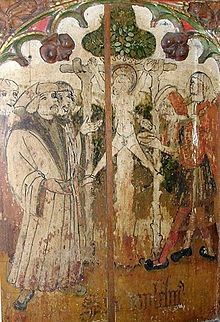 In England in 1144, the Jews of Norwich were accused of ritual murder after a boy, William of Norwich, was found dead with stab wounds in the woods. William's hagiographer, Thomas of Monmouth, claimed that every year there is an international council of Jews at which they choose the country in which a child will be killed during Easter, because of a Jewish prophecy that states that the killing of a Christian child each year will ensure that the Jews will be restored to the Holy Land. In 1144, England was chosen, and the leaders of the Jewish community delegated the Jews of Norwich to perform the killing. They then abducted and crucified William. The legend was turned into a cult, with William acquiring the status of a martyr and pilgrims bringing offerings to the local church. After the death of Little Saint Hugh of Lincoln, there were trials and executions of Jews. The case is mentioned by Matthew Paris and Chaucer, and thus has become well-known. Its notoriety sprang from the intervention of the Crown, the first time an accusation of ritual killing had been given royal credibility. The eight-year-old Hugh disappeared at Lincoln on 31 July 1255. His body was probably discovered on 29 August, in a well. A Jew named Copin or Koppin confessed to involvement. He confessed to John of Lexington, a servant of the crown, and relative of the Bishop of Lincoln. The church stood to gain from the establishment of a martyr's cult. Copin's confession was probably in return for the promise that his life should be spared. He is said to have confessed that the boy had been crucified by the Jews, who had assembled at Lincoln for that purpose. King Henry III, who had reached Lincoln at the beginning of October, had Copin executed and 91 of the Jews of Lincoln seized and sent up to London, where 18 of them were executed. The rest were pardoned at the intercession of the Franciscans or Dominicans. Within a few decades, Jews would be expelled from all of England in 1290 and not allowed to return until 1657. 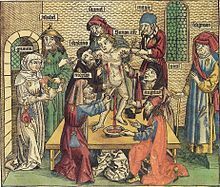 Much like the blood libel of England, the history of blood libel in continental Europe consists of unsubstantiated claims made about the (sometimes) discovered corpses of Christian children. There were frequently associated supernatural events speculated about these discoveries and corpses, events which were often attributed by contemporaries to miracles. Also, just as in England, these accusations in continental Europe typically resulted in the execution of numerous Jews — sometimes even all, or close to all, the Jews in one town. These accusations and their effects also, in some cases, led to royal interference on behalf of the Jews. Thomas added that the Jews had misunderstood the words of their prophet, who by his expression "solo sanguine Christiano" had meant not the blood of any Christian, but that of Jesus – the only true remedy for all physical and spiritual suffering. Thomas did not mention the name of the "very learned" proselyte, but it may have been Nicholas Donin of La Rochelle, who, in 1240, had a disputation on the Talmud with Yechiel of Paris, and who in 1242 caused the burning of numerous Talmudic manuscripts in Paris. It is known that Thomas was personally acquainted with this Nicholas. Nicholas Donin and another Jewish convert, Theobald of Cambridge, are greatly credited with the adoption and the belief of the blood libel myth in Europe. The first known case outside England was in Blois, France, in 1171. This was the site of a blood libel accusation against the town's entire Jewish community that led to around 31–33 Jews (with 17 women making up this total) being burned to death. on 29 May of that year, or the 20th of Sivan of 4931. The blood libel revolved around R. Isaac, a Jew whom a Christian servant reported had deposited a murdered Christian in the Loire. The child's body was never found. The count had the about 40 adult Blois Jews arrested and they were eventually to be burned. The surviving members of the Blois Jewish community, as well as surviving holy texts, were ransomed. As a result of this case, the Jews garnered new promises from the king. The burned bodies of the sentenced Jews were supposedly maintained unblemished through the burning, a claim which is a well-known miracle, martyr myth for both Jews and Christians. There is significant primary source material from this case including a letter revealing moves for Jewish protection with King Louis VII. Responding to the mass execution, the 20th of Sivan was declared a fast day by Rabbenu Tam. In this case in Blois, there was not yet the myth proclaimed that Jews needed the blood of Christians. At Pforzheim, Baden, in 1267, a woman supposedly sold said girl over to Jews who, according to the myth, then cut her open and dumped her in the Enz River. Boatmen found her, she apparently ordered vengeance, and then passed. The body apparently bled as the suspected Jews were brought to it. The woman and the reportedly involved Jews confessed and were then subsequently killed. That a judicial murder was then and there committed against the Jews in consequence of the accusation is evident from the manner in which the Nuremberg "Memorbuch" and the synagogal poems refer to the incident (Siegmund Salfeld, Das Martyrologium des Nürnberger Memorbuches (1898), pp. 15, 128–130). In 1270, at Weissenburg, of Alsace, a miracle alone decided the charge against the Jews. A child's body had shown up in the Lauter River. Supposedly, Jews cut into the child to acquire his blood and the child apparently continued bleeding for five days. At Oberwesel, near Easter of 1287, "miracles" again constituted the only evidence against the Jews. 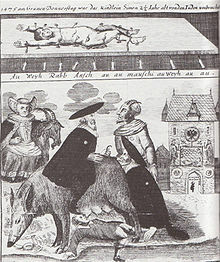 The corpse of the 16-year-old Werner of Oberwesel (also referred to as "Good Werner") apparently landed at Bacharach and the body supposedly caused miracles, particularly medicinal miracles. Also, there was apparently light coming from the body. Reportedly, the child was hung upside down, forced to throw up the host and was cut open. In consequence, the Jews of Oberwesel and many other adjacent localities were severely persecuted during the years 1286-89. The Jews of Oberwesel were particularly targeted because there were no Jews remaining in Bacharach following a 1283 pogrom. Additionally, there were pogroms following this case as well at and around Oberwesel. Rudolph of Hapsburg, to whom the Jews had appealed for protection, in order to manage the "miracle" story, supposedly had the archbishop of Mainz declare great wrong had been done to the Jew. This apparent declaration was very limited in effectiveness. A statement was made, in the "Chronicle" of Konrad Justinger of 1423, that at Bern in 1293 or 1294 the Jews tortured and murdered a boy called Rudolph (sometimes also referred to as Rudolph, Ruff, or Ruof). The body was reportedly found by the house of Jöly, a Jew. The Jewish community was then implicated. The penalties imposed upon the Jews included torture, execution, expulsion, and steep financial fines. Justinger argued Jews were out to harm Christianity. The historical impossibility of this widely credited story was demonstrated by Jakob Stammler, pastor of Bern, in 1888. There have been several explanations put forth as to why these blood libel accusations were made and perpetuated. For example, it has been argued Thomas of Monmouth's account and other similar false accusations, as well as their perpetuation, largely had to do with the economic and political interests of leaders who did, in fact, perpetuate these myths. Additionally, it was largely believed in Europe that Jews used Christian blood for medicinal and other purposes. Despite the unsubstantiated, mythical nature of these claims, as well as their sources, they evidently materially impacted the communities in which they occurred including both the Jewish and non-Jewish populations. Christopher of Toledo, also known as Christopher of La Guardia or "the Holy Child of La Guardia", was a four-year-old Christian boy supposedly murdered by two Jews and three Conversos (converts to Christianity). In total, eight men were executed. It is now believed that this case was constructed by the Spanish Inquisition to facilitate the expulsion of Jews from Spain. He was canonized by Pope Pius VII in 1805. Christopher has since been removed from the canon. In Rinn, near Innsbruck, a boy named Andreas Oxner (also known as Anderl von Rinn) was said to have been bought by Jewish merchants and cruelly murdered by them in a forest near the city, his blood being carefully collected in vessels. The accusation of drawing off the blood (without murder) was not made until the beginning of the 17th century, when the cult was founded. The older inscription in the church of Rinn, dating from 1575, is distorted by fabulous embellishments – for example, that the money paid for the boy to his godfather turned into leaves, and that a lily blossomed upon his grave. The cult continued until officially prohibited in 1994, by the Bishop of Innsbruck. One of the child-saints in the Russian Orthodox Church is the six-year-old boy Gavriil Belostoksky from the village Zverki. According to the legend supported by the church, the boy was kidnapped from his home during the holiday of Passover while his parents were away. Shutko, who was a Jew from Białystok, was accused of bringing the boy to Białystok, poking him with sharp objects and draining his blood for nine days, then bringing the body back to Zverki and dumping it at a local field. A cult developed, and the boy was canonized in 1820. His relics are still the object of pilgrimage. On All Saints Day, 27 July 1997, the Belarusian state TV showed a film alleging the story is true. The revival of the cult in Belarus was cited as a dangerous expression of antisemitism in international reports on human rights and religious freedoms which were passed to the UNHCR. In 1899 Hilsner Affair: Leopold Hilsner, a Czech Jewish vagabond, was accused of murdering a nineteen-year-old Christian woman, Anežka Hrůzová, with a slash to the throat. Despite the absurdity of the charge and the relatively progressive nature of society in Austria-Hungary, Hilsner was convicted and sentenced to death. He was later convicted of an additional unsolved murder, also involving a Christian woman. In 1901, the sentence was commuted to life imprisonment. Tomáš Masaryk, a prominent Austro-Czech philosophy professor and future president of Czechoslovakia, spearheaded Hilsner's defense. He was later blamed by Czech media because of this. In March 1918, Hilsner was pardoned by Austrian emperor Charles I. He was never exonerated, and the true guilty parties were never found. The 1944–1946 Anti-Jewish violence in Poland, which according to some estimates killed as many as 1000–2000 Jews (237 documented cases)), involved, among other elements, accusations of blood libel, especially in the case of the 1946 Kielce pogrom. In 2003, a private Syrian film company created a 29-part television series Ash-Shatat ("The Diaspora"). This series originally aired in Lebanon in late 2003 and it was subsequently broadcast by Al-Manar, a satellite television network owned by Hezbollah. This TV series, based on the antisemitic forgery The Protocols of the Learned Elders of Zion, shows the Jewish people engaging in a conspiracy to rule the world, and it also presents Jews as people who murder the children of Christians, drain their blood and use this blood to bake matzah. In early January 2005, some 20 members of the Russian State Duma publicly made a blood libel accusation against the Jewish people. They approached the Prosecutor General's Office and demanded that Russia "ban all Jewish organizations." They accused all Jewish groups of being extremist, "anti-Christian and inhumane, and even accused them of practices that include ritual murders." Alluding to previous antisemitic Russian court decrees that accused the Jews of ritual murder, they wrote that "Many facts of such religious extremism were proven in courts." The accusation included traditional antisemitic canards, such as "the whole democratic world today is under the financial and political control of international Jewry. And we do not want our Russia to be among such unfree countries". This demand was published as an open letter to the prosecutor general, in Rus Pravoslavnaya (Русь православная, "Orthodox Russia"), a national-conservative newspaper. This group consisted of members of the ultra-nationalist Liberal Democrats, the Communist faction, and the nationalist Motherland party, with some 500 supporters. The mentioned document is known as "The Letter of Five Hundred" ("Письмо пятисот"). Their supporters included editors of nationalist newspapers as well as journalists. By the end of the month, this group was strongly criticized, and it retracted its demand in response. At the end of April 2005, five boys, ages 9 to 12, in Krasnoyarsk (Russia) disappeared. In May 2005, their burnt bodies were found in the city sewage. The crime was not disclosed, and in August 2007 the investigation was extended until 18 November 2007. Some Russian nationalist groups claimed that the children were murdered by a Jewish sect with a ritual purpose. Nationalist M. Nazarov, one of the authors of "The Letter of Five Hundred" alleges "the existence of a 'Hasidic sect', whose members kill children before Passover to collect their blood", using the Beilis case mentioned above as evidence. M.Nazarov also alleges that "the ritual murder requires throwing the body away rather than its concealing". "The Union of the Russian People" demanded officials thoroughly investigate the Jews, not stopping at the search in synagogues, Matzah bakeries and their offices. During a speech in 2007, Raed Salah, the leader of the northern branch of the Islamic Movement in Israel, referred to Jews in Europe having in the past used children's blood to bake holy bread. "We have never allowed ourselves to knead [the dough for] the bread that breaks the fast in the holy month of Ramadan with children's blood", he said. "Whoever wants a more thorough explanation, let him ask what used to happen to some children in Europe, whose blood was mixed in with the dough of the [Jewish] holy bread." However, despite the firman, pogroms spread through the Middle East and North Africa: Aleppo (1850, 1875), Damascus (1840, 1848, 1890), Beirut (1862, 1874), Dayr al-Qamar (1847), Jaffa (1876), Jerusalem (1847, 1870, 1895), Cairo (1844, 1890, 1901–02), Mansura (1877), Alexandria (1870, 1882, 1901–07), Port Said (1903, 1908), and Damanhur (1871, 1873, 1877, 1891). In the 1910 Shiraz blood libel, the Jews of Shiraz, Iran, were falsely accused of murdering a Muslim girl. The entire Jewish quarter was pillaged, with the pogrom leaving 12 Jews dead and about 50 injured. Muslims have repeated the blood libel into the present. In 1983, Mustafa Tlass, the Syrian Minister of Defense, wrote and published The Matzah of Zion, which is a treatment of the Damascus affair of 1840 that repeats the ancient "blood libel", that Jews use the blood of murdered non-Jews in religious rituals such as baking Matza bread. In this book, he argues that the true religious beliefs of Jews are "black hatred against all humans and religions", and that no Arab country should ever sign a peace treaty with Israel. Tlass re-printed the book several times, and he stands by its conclusions. Following the book's publication, Tlass told Der Spiegel, that this accusation against Jews was valid and that his book is "an historical study ... based on documents from France, Vienna and the American University in Beirut." Nevertheless, blood libel stories have appeared in modern times on many occasions in the state-sponsored media of a number of Arab and Muslim nations, their television shows and websites, and books alleging instances of the Jewish blood libels are not uncommon there. The blood libel was featured in a scene in the Syrian TV series Ash-Shatat, shown in 2003, while in 2013 the Israeli website Arutz Sheva reported cases of Israeli Arabs asking "where Jews find the Christian blood they need to bake matza". In 2007, Lebanese poet, Marwan Chamoun, in an interview aired on Télé Liban, referred to the "... slaughter of the priest Tomaso de Camangiano ... in 1840... in the presence of two rabbis in the heart of Damascus, in the home of a close friend of this priest, Daud Al-Harari, the head of the Jewish community of Damascus. After he was slaughtered, his blood was collected, and the two rabbis took it." A novel, Death of a Monk, based on the Damascus affair, was published in 2004. ^ a b Gottheil, Richard; Strack, Hermann L.; Jacobs, Joseph (1901–1906). "Blood Accusation". Jewish Encyclopedia. New York: Funk & Wagnalls. ^ a b Dundes, Alan, ed. (1991). The Blood Libel Legend: A Casebook in Anti-Semitic Folklore. University of Wisconsin Press. ISBN 978-0-299-13114-2. ^ a b Chanes, Jerome A. Antisemitism: A Reference Handbook, ABC-CLIO, 2004, pp. 34–45. "Among the most serious of these [anti-Jewish] manifestations, which reverberate to the present day, were those of the libels: the leveling of charges against Jews, particularly the blood libel and the libel of desecrating the host." ^ Goldish, Matt. Jewish Questions: Responsa on Sephardic Life in the Early Modern Period, Princeton University Press, 2008, p. 8. "In the period from the twelfth to the twentieth centuries, Jews were regularly charged with blood libel or ritual murder – that Jews kidnapped and murdered non-Jews as part of a Jewish religious ritual." ^ "What does 'blood libel' mean?". 12 January 2011. Retrieved 16 April 2018 – via www.bbc.com. ^ Jim Geraghty (12 January 2011). "The Term 'Blood Libel': More Common Than You Might Think". National Review. Retrieved 16 April 2018. ^ Boteach, Shmuley (14 January 2011). "Sarah Palin Is Right About 'Blood Libel'". wsj.com. ^ What is kashrut; "Eating blood is forbidden. Blood is blood, whether it comes from a human being or an animal. In prohibiting the consumption of blood, the Torah seems to be concerned that it can excite a blood-lust in human beings and may desensitize us to the suffering of human beings when their blood is spilled." ^ "Bible Gateway passage: Leviticus 3:17 – New Revised Standard Version". Bible Gateway. Retrieved 12 March 2018. ^ "Bible Gateway passage: Leviticus 7:26 – New Revised Standard Version". Bible Gateway. Retrieved 12 March 2018. ^ David Patterson (2015). Anti-Semitism and Its Metaphysical Origins. Cambridge University Press. p. 1. ISBN 978-1-107-04074-8. ^ "Blood libel in Syria". Jewishvirtuallibrary.org. Retrieved 23 January 2010. ^ Lily Galili (18 February 2007). "And if it's not good for the Jews?". Haaretz. Retrieved 18 February 2007. ^ Paper on William of Norwich presented to the Jewish Historical Society of England by Raphael Langham Archived 1 May 2013 at WebCite; Langmuir, Gavin I (1996), Toward a Definition of Antisemitism, University of California Press, pp. 216ff. ^ Herbermann, Charles, ed. (1913). "St. William of Norwich" . Catholic Encyclopedia. New York: Robert Appleton. ^ Design, SUMO. "The 1190 Massacre: History of York". www.historyofyork.org.uk. ^ "The Knight's Tale of Young Hugh of Lincoln", Gavin I. Langmuir, Speculum, Vol. 47, No. 3 (July 1972), pp. 459–482. ^ Albert Ehrman, "The Origins of the Ritual Murder Accusation and Blood Libel," Tradition: A Journal of Orthodox Jewish Thought, Vol. 15, No. 4 (Spring 1976): 88. ^ Hallo, William W.; Ruderman, David B.; Stanislawski, Michael, eds. (1984). Heritage: Civilization and the Jews: Source Reader. Santa Barbara, California: Praeger Special Studies. p. 134. ISBN 978-0275916084. ^ "The Martyrs of Blois". Chabad.org. 16 June 2006. Retrieved 23 January 2010. ^ Trachtenberg, Joshua, ed. (1943). The Devil and the Jews, The Medieval Conception of the Jew and its Relation to Modern Anti-Semitism. Yale University Press. ISBN 0-8276-0227-8. ^ Susan L. Einbinder "Pucellina of Blois: Romantic Myths and Narrative Conventions," Jewish History, Vol. 12, No. 1 (Spring 1998): 29. ^ a b Susan L. Einbinder "Pucellina of Blois: Romantic Myths and Narrative Conventions," Jewish History, Vol. 12, No. 1 (Spring 1998): 30-31. ^ Susan L. Einbinder "Pucellina of Blois: Romantic Myths and Narrative Conventions," Jewish History, Vol. 12, No. 1 (Spring 1998): 31. ^ a b Albert Ehrman, "The Origins of the Ritual Murder Accusation and Blood Libel," Tradition: A Journal of Orthodox Jewish Thought, Vol. 15, No. 4 (Spring 1976): 85. ^ Steven K. Baum, "When Fairy Tales Kill," Journal for the Study of Antisemitism, Vol. 1, No. 2 (2009): 190-191. ^ a b "Blood Libel," Zionism and Israel — Encyclopedic Dictionary, n.d. http://www.zionism-israel.com/dic/blood_libel.htm. ^ Jörg R. Müller, "Ereẓ gezerah—‘Land of Persecution’: Pogroms against the Jews in the regnum Teutonicum from c. 1280 to 1350," The Jews of Europe in the Middle Ages (Tenth to Fifteenth Centuries): Proceedings of the International Symposium, ed. Christoph Cluse (20–25 October 2002): 249. ^ a b Ariel Toaff, Blood Passover, trans. Gian Marco Lucchese and Pietro Gianetti (AAARG, 2007): 64. ^ Jörg R. Müller, "Ereẓ gezerah—‘Land of Persecution’: Pogroms against the Jews in the regnum Teutonicum from c. 1280 to 1350," The Jews of Europe in the Middle Ages (Tenth to Fifteenth Centuries): Proceedings of the International Symposium, ed. Christoph Cluse (20–25 October 2002): 249-250. ^ Jörg R. Müller, "Ereẓ gezerah—‘Land of Persecution’: Pogroms against the Jews in the regnum Teutonicum from c. 1280 to 1350," The Jews of Europe in the Middle Ages (Tenth to Fifteenth Centuries): Proceedings of the International Symposium, ed. Christoph Cluse (20–25 October 2002): 250. ^ Ibid.Jörg R. Müller, "Ereẓ gezerah—‘Land of Persecution’: Pogroms against the Jews in the regnum Teutonicum from c. 1280 to 1350," The Jews of Europe in the Middle Ages (Tenth to Fifteenth Centuries): Proceedings of the International Symposium, ed. Christoph Cluse (20–25 October 2002): 250. ^ a b Albert Winkler, "The Approach of the Black Death in Switzerland and the Persecution of Jews, 1348–1349," Swiss American Historical Society Review, Vol. 43, No. 3 (2007): 14. ^ "Katholische Schweizer-Blätter", Lucerne, 1888. ^ Jeffrey Cohen, Review of The Murder of William of Norwich: The Origins of the Blood Libel in Medieval Europe, by E.M. Rose Journal of Interdisciplinary History, Vol. 47, No. 3 (Winter 2017): 410. ^ Joshua Trachtenberg, The Devil and the Jews: The Medieval Conception of the Jew and its Relation to Modern Anti-Semitism. (Vardo Books, 2001): 142-143. ^ Edmund Levin, The Exoneration of Raphael Levy, Wall Street Journal, 2 February 2014. Accessed 10 October 2016. ^ "F:\WORK\RELFREE03075.000" (PDF). Archived from the original (PDF) on 6 January 2010. Retrieved 23 January 2010. ^ "U.S. Department of State Annual Report on International Religious Freedom for 2006 - Belarus". UNHCR. Archived from the original on 7 September 2007. Retrieved 10 August 2013. ^ Avrutin, Eugene (2017). 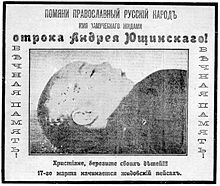 The Velizh Affair: Blood Libel in a Russian Town. Oxford: Oxford University Press. ISBN 9780190640521. ^ Malamud, Bernard, ed. (1966). The Fixer. POCKET BOOKS, a Simon & Schuster division of GULF & WESTERN CORPORATION. ISBN 0-671-82568-2. ^ German propaganda archive – Caricatures from Der Stürmer, Calvin College website. ^ Gerber, Gane S. (1986). "Anti-Semitism and the Muslim World". In Berger, David (ed.). History and hate: the dimensions of anti-Semitism. Philadelphia: Jewish Publication Society. p. 88. ISBN 0-8276-0267-7. LCCN 86002995. OCLC 13327957. ^ "Письмо пятисот. Вторая серия. Лучше не стало". Xeno.sova-center.ru. Retrieved 23 January 2010. ^ "Русская линия / Актуальные темы / "Письмо пятисот": Обращение в Генеральную прокуратуру представителей русской общественности с призывом запретить в России экстремистские еврейские организации". Rusk.ru. Retrieved 23 January 2010. ^ "The investigation of the murder of five schoolboys in Krasnoyarsk was extended again (Regnum, 20 August 2007)". Regnum.ru. 20 August 2007. Retrieved 23 January 2010. ^ ""Jewish people were accused with murder of children in Krasnoyarsk" ("Regnum", 12 May 2005)". Regnum.ru. 16 May 2005. Retrieved 23 January 2010. ^ "Russian nationalistic publishers "Russian Idea", the article about the antisemitic movement "Living Without the Fear of the Jews. ", June 2007: "...the murder of five children in Krasnoyarsk, which bodies were bloodless. Our layer V. A. Solomatov said that there is undoubtedly a ritual murder..."". Rusidea.org. Retrieved 23 January 2010. ^ "В убийстве красноярских детей обвинили евреев и вспомнили дело Бейлиса" [Hasids were accused in Krasnoyarsk children murder, the Beilis Affair was reanimated]. regnum.ru. 16 May 2005. ^ "Islamic Movement head charged with incitement to racism, violence", Haaretz, 29 January 2008. ^ Blood Libel on Hamas' Al-Aqsa TV – American Center for Islamic Research President Dr. Sallah Sultan: Jews Murder Non-Jews and Use Their Blood for Passover Matzos, MEMRI, Special Dispatch No. 2907, 14 April 2010. ^ Blood Libel on Hamas TV - President of the American Center for Islamic Research Dr. Sallah Sultan: Jews Murder Non-Jews and Use Their Blood to Knead Passover Matzos, MEMRITV, clip no. 2443 – Transcript, 31 March 2010 (video clip available here). ^ Islamic group invited anti-Semitic speaker Archived 16 August 2011 at the Wayback Machine, The Local (Sweden's News in English), 25 March 2011. ^ Egypt: More Calls to Murder Israelis by Maayana Miskin, Arutz Sheva 7 (Isranelnationalnews.com), 28 August 2011. ^ Why the Muslim Association doesn’t expresses reservations towards Antisemitism by Willie Silberstein, Coordination Forum for Countering Antisemitism (CFCA), 17 April 2011. ^ Saudi Cleric Salman Al-Odeh: Jews Use Human Blood for Passover Matzos, MEMRITV, Clip No. 3536, (transcript), 13 August 2012. ^ Saudi cleric accuses Jewish people of genocide, drinking human blood by Ilan Ben Zion, The Times of Israel, 16 August 2012. ^ Egyptian Politician Khaled Zaafrani: Jews Use Human Blood for Passover Matzos, MEMRITV, Clip No. 3873 (transcript), 24 May 2013 (see also: Video Clip). ^ Egyptian Politician: Jews Use Human Blood for Passover Matzos by Elad Benari, Arutz Sheva, 17 June 2013. ^ Egyptian politician revives Passover blood libel by Gavriel Fiske, Times of Israel, 19 June 2013. ^ Egyptian Politician Smiles Giddily as He Pushes anti-Semitic Libel that Jews Use Blood of Christian Children for Passover Matzos by Sharona Schwartz, The Blaze, 17 June 2013. ^ Blood libel: the myth that fuels anti-Semitism by Candida Moss and Joel Baden, special to CNN, 6 August 2014. ^ Friday Sermon by Former Jordanian Minister: Jews Use Children's Blood for Their Holiday Matzos, MEMRI Clip No. 4454 (transcript), 22 August 2014. (video clip available here). ^ As shown by David Kertzer in The Popes Against the Jews (New York, 2001), pp. 161–63. ^ Pope Gregory X. "Medieval Sourcebook: Gregory X: Letter on Jews, (1271-76) - Against the Blood Libel". Retrieved 7 May 2007. ^ Gianfranco Miletto, "The Human Body as a Musical Instrument in the Sermons of Judah Moscato", in The Jewish Body: Corporeality, Society, and Identity in the Renaissance and Early Modern Period, edited by Giuseppe Veltri and Maria Diemling (Leiden, 2009), p. 384. ^ Marina Caffiero, Forced Baptisms: Histories of Jews, Christians, and Converts in Papal Rome, translated by Lydia G. Cochrane (University of California Press, 2012), pp. 34-36. ^ Mansel, Phillip (1998). Constantinople: City of the World's Desire, 1453–1924. New York: St. Martin's Griffin. p. 124. ISBN 978-0-312-18708-8. ^ a b Lewis, Donald (2 January 2014). The Origins of Christian Zionism: Lord Shaftesbury And Evangelical Support For A Jewish Homeland. Cambridge: Cambridge University Press. p. 380. ISBN 9781107631960. ^ Yossef Bodansky. Islamic Anti-Semitism as a Political Instrument Co-Produced by The Ariel Center for Policy Research and The Freeman Center for Strategic Studies, 1999. ISBN 978-0-9671391-0-4, see also The Encyclopedia of World History By Peter N. Stearns, William Leonard Langer p. 527. 2001. ^ An Anti-Jewish Book Linked to Syrian Aide, The New York Times, 15 July 1986. ^ Blood Libel Judith Apter Klinghoffer, History News Network, 19 December 2006. ^ Osama El-Baz. "Al-Ahram Weekly Online, 2–8 January 2003 (Issue No. 619)". Weekly.ahram.org.eg. Retrieved 23 January 2010. Dundes, Alan (1991). The Blood Libel Legend: A Casebook in Anti-Semitic Folklore. University of Wisconsin Press. ISBN 978-0-299-13114-2. Hillaby, Joe; Hillaby (2013). The Palgrave Dictionary of Medieval Anglo-Jewish History. Basingstoke: Palgrave Macmillan. p. 468. ISBN 978-0230278165. Karl Heinz Göller: "Sir Hugh of Lincoln. From History to Nursery Rhyme." In Bernd Engler and Kurt Müller, eds. Jewish Life and Jewish Suffering as Mirrored in English and American Literature. Paderborn: Schöningh, 1987. pp. 17–31.